By Toren Chenault — Black History Month is a time to celebrate. I love being black, and I love everything about my culture. And I think it’s important to celebrate culture, no matter who you are. I also love comic books and am in the process of writing my first comic. As a future comic creator and as a black male, I think it’s important to acknowledge the strides we’ve made in the comic book industry when it comes to diversity. See, we still have a long way to go, though. In fact, it saddens me the low number of black writers and artists I see in mainstream comics today. But there are creators like myself that are working night and day, creating wondrous new worlds, hoping to change that one day. Today though I want to focus on some of my favorite black characters in comics. Most will be superheroes, some will be from smaller companies, but each has touched my soul in a special way. Representation matters. It isn’t just a catchy phrase you should say on Twitter when you’re feeling empathetic. It really does matter. It’s just a great feeling to see yourself in a comic. So, welcome to a special “Why I Love” about black superheroes and black characters. In this piece I want to spotlight these special characters but also let you know where you can find them currently in the comics. It can be easy to miss things, and we shouldn’t shame others for not knowing what’s out. So, if you didn’t know a certain character was still around, don’t feel bad. This piece is here to help. First up is a DC character who doesn’t get as much love as he deserves—Mr. Terrific. Mr. Terrific by Alex Ross. A lot of the heroes and characters on this list defy stereotypes when it comes to black characters. Not every black character should come from violence or be inherently “tough.” Black people, like all humans, are complex. Michael Holt, aka Mr. Terrific, is a good example of that. He’s a hero born from tragedy, like most are, and he’s a hero who lives with enormous guilt. Mr. Terrific has always been a favorite of mine because of his combination of style and intellect. Not only does he have multiple, multiple Ph.Ds (I think 14 to be exact), but he’s one of the coolest looking characters in the DC Universe. One of the first images I ever saw of Mr. Terrific was the single portrait legendary artist Alex Ross did for the JSA comic. The spheres floating around him, the black “T” on his face, the red, white, and black jacket that says, “Fairplay”...I was hooked. And after reading things like JSA, he became one of my favorites. Sometimes, writers who aren’t black tend to make their black characters too cool. They’ll rely too much on that aspect of the character and let it overtake their personality. Mr. Terrific is the blueprint for how to balance this. The perfect combination of swag and smarts. Where is he now? Mr. Terrific is one of those characters I don’t think DC Comics as a company understands exactly how awesome he is. He still has an insane amount of untapped potential. He hasn’t been around too much in recent years, but you can currently find him leading his own team in The Terrifics. It was a part of the New Age of Heroes launch, and it currently remains one of my favorite titles at DC. Written by Jeff Lemire, the comic has been a good developmental series for Mr. Terrific. It dives into his loneliness and his past, and it also showcases just how much of a smart, capable leader he is. I literally grew up on the DC Animated Universe. I didn’t have money or any way to read comics weekly growing up, so the DCAU was my education on the DC Universe. And what an education. Cyborg came from that era, and when I saw him on Teen Titans, he became one of my favorites. Where is he now? I’m going to be honest, I haven’t been a fan of the way Cyborg has been handled in the comics in recent years. He was promoted to the Justice League during the New 52 reboot, but I think with that came the disappearance of some important character traits, as well as history in the DC Universe. But I enjoy good content when I can get it, and that’s exactly what the more recent comic, Justice League Odyssey, is. Cyborg is currently on a cosmic adventure with Starfire, Jessica Cruz, and Azrael. Oh, and Darkseid is involved too. It’s a cool series so far, and just like with The Terrifics, it highlights some of what makes Cyborg a great character. These next two heroes I included as a pair because black love in comics is important. Each is important by themselves, but together, they represent something amazing that we need in comics. Blue Marvel is Adam Brashear (created by black comic creator Kevin Grevioux) and Monica Rambeau is Spectrum. They have some of the coolest powers in the Marvel universe. Blue Marvel is a literal antimatter reactor and Spectrum does what her name suggests. She can become any form of light on the electromagnetic spectrum. My love for them came from Al Ewing and Kenneth Rocafort’s Ulimates. In that comic, they were part of a powerhouse team with Carol Danvers, T’Challa, and America Chavez. It was a series filled with cosmic craziness, cool concepts, and beautiful art. That series starts with Blue Marvel holding a holographic representation of the element Neutronium as he talks about its complex nature and how it relates to the multiverse. It’s still one of my favorite openings of a comic, and it did a good job setting the stage for what was to come. The pair have a natural attraction to each other, and I love it because it always comes off as genuine. There’s a scene in the story where Blue Marvel is studying Spectrum’s powers. He’s talking about how magnificent and wonderful they are. Of course, he’s speaking in terms of science, but to him science is beautiful, so Spectrum is beautiful. I guess that begs the question does he only love her because of her powers, but I don’t think that’s true. Monica Rambeau is one of the most respected, hardworking people in the Marvel Universe. And I think Blue Marvel recognizes that. Her magnificent powers are just a plus. Where are they now? We were bound to get here eventually, to characters who haven’t been too active as of late. Marvel is sitting on two of their most powerful cosmic characters right now, and I don’t know why. Ever since The Ultimates ended, Blue Marvel and Spectrum have been scarce. I’m hoping they show up in the new Avengers weekly No Road Home. Still, this doesn’t take away from these great characters and their beautiful relationship. Miles Morales is becoming a break-out star thanks to the new film Into the Spiderverse. I’ve always liked Miles Morales. But in recent years, I’ve become fond of the character. He’s this generation’s Spider-Man and has grown tremendously since his creation. He’s an Afro-Latino hero, and that’s important to his character. I’m not Latino myself, but I recognize the importance of not erasing that side of who he is. Neither side of his ethnicity is more important, and they don’t take away from each other. Like many others, my love for Miles has intensified ever since his film, Spider-Man: Into the Spiderverse came out. It was an authentic, masterful film with tons of heart and action. They made Miles relatable and really drove home the fact that he’s just a good kid trying to do the right thing. He likes art, music, has style, and is still growing as a person. He’s forced to grow up exponentially when he gets his powers, and I loved going on that journey with him—both in the movie and in the comics. Miles continues to be one of the brightest spots for Marvel in recent memory. Where is he now? There’s plenty of Miles content today, and it’s all amazing. There’s his own title being written by Saladin Ahmed and drawn by Javier Garron. And then there’s Miles on his team, the Champions, and they have their own title, too. Written by Jim Zub and drawn by Steven Cummings. If you loved Into the Spiderverse, but don’t know where to start with his comics, these are perfect as they both had new #1s recently. If you’ve read any of my pieces before, you know that I’m a huge fan of Valiant Comics. And within the last two years one of their characters has had the best development in all of superhero comics. Her name is Amanda McKee and she goes by Livewire. An extremely powerful technopath, Livewire debuted in 2011 as a side character who’s loyal to her teacher. Now, she’s a fugitive who led an uprising across the Valiant Universe. She’s become one of my favorites in all of comics, and Valiant has done a tremendous job developing her since her debut. Livewire, like most of the other heroes on this list, defies stereotypes and expectations of black superheroes. Especially black women. Livewire has been Toyo Harada’s most trusted student, leader of Valiant’s super team Unity, and she brought together a group of psiots called the Secret Weapons. Where is she now? I recommend going back and reading the original Harbinger series where Livewire first debuted. Then you can find her in titles like Unity and Secret Weapons. But now, she’s the star of her very own title. It’s being written by talented writer Vita Ayala and the art is being done by the amazing team of Raul Allen and Patricia Martin. It’s one of the best titles not just at Valiant, but in all of comics right now. Now we’re on to possibly my favorite black superhero in comics today. Abram Adams is Divinity, and he is the most powerful character in the Valiant Universe. That right there means a lot to me. Not only that, but I relate so much to Divinity. His origin is one of circumstance and tragedy. He was left on the doorstep of the Russian government and was trained to become an astronaut. Abram wanted to go to space, though. His obsession with knowledge and learning drove him during his training. And it was that exact obsession that led to him interacting with a cosmic energy that turned him into a God. Writer Matt Kindt and artist Trevor Hairsine worked on the original Divinity trilogy. And in it, Divinity narrates about life being like a big book. And how he always wanted to see all the pages, reading it all at once. Once he got his powers, he could, but he lost a piece of himself. He lost his wife, his daughter, and everything he was before. There’s a quote from Divinity #4 that is one of my favorite pieces of writing ever. If you enjoy science-fiction and want new black superheroes, please read Divinity. Where is he now? Divintiy hasn’t been around too much recently, but he is a newer character. Kindt and Hairsine worked on Divitniy I, II, and III, and then they worked on its sequel comic, Eternity. Divinity also showed up in Harbinger Wars 2. I’m sure he’ll be around in the future of Valiant. There were a lot of heroes I didn’t get to. But then again, there really aren’t that many. I mean a couple of things by that. The first being that I didn’t include a good portion of characters. There’s Nighthawk, Black Panther, Vixen, Luke Cage, Sam Wilson, Moon Girl, Mosaic, John Stewart, Static, Steel, Misty Knight, and Black Lightning. There are all amazing characters who bring something different to the table. Both in terms of powers and representation. But there’s a bigger problem with black superheroes. And I’m not even asking for more. Especially from big companies. As a fan of comic books and superheroes, logically I wouldn’t mind seeing more black characters from companies like Marvel and DC. But, as a black man living in America in 2019, I understand the realism of companies who profit mainly off heroes who look like Batman and Spider-Man, not constantly creating black superheroes. Yes, things like Black Panther and Into the Spiderverse exist, and both are amazing, amazing feats of cinema, but one or two films won’t fix an institutional problem we have in comic books. What’s the solution? More representation behind the scenes and us, fans and smaller creators, supporting each other. I love black superheroes. Because I get a chance to see myself in them. It’s just cool to see someone who looks like you do something awesome. Sometimes, that’s all minorities want. That’s really all anybody wants. There doesn’t have to be a deep message all the time. Just someone who looks like you, doing awesome stuff. And in this article I wanted to emphasize the role we as fans play in supporting black superheroes. Support Marvel and DC when they put out good content like the comics and characters I described up top. But also focus elsewhere. Valiant, Image, BOOM! Studios, and even Dark Horse are all starting to showcase black characters more. Try to get out of your comfort zone and venture into other titles. But also, support up and coming black creators. Where publishers don’t shine, independent creators flourish. There’s a bevy of black creators today making their own worlds, universes, and characters. It can definitely feel overwhelming sometimes. Trust me though, good content is out there, but we have to support it in order to see more. Toren Chenault, a native of the Cincinnati area, currently lives in Michigan with his girlfriend. A graduate of Michigan State University, he is a long-time superhero fan who counts Captain Atom, Carol Danvers’ Captain Marvel, Daredevil, Divinity, Nightwing, and XO Manowar among his favorite heroes. Mystic Man is his first book. Buy it now here, and check out more of Toren’s Why I Love series here. By Zack Quaintance — Despite the name of this website (which is ironic! ), I’m prone to Batman fatigue. It’s not that I don’t like the character. No, I think it’s pretty easy to make a case for Batman being one of the most compelling characters to ever grow from American fiction. It’s just that I don’t often see much new ground for stories about Batman to cover, so prolific are DC’s Batman releases. That said, I still fairly regularly find myself drawn into and torn up by well-done Batman stories. This week ambushed me in that way. As you’ll notice shortly, two of our Top Comics to Buy for December 12 star the Dark Knight, while a third gets a recommendation in our new #1 comics section. So yes, this is a great week for all things Batman. It’s also a great week for Marvel’s (arguable) flagship character, Spider-Man, as Amazing Spider-Man hums right along and Miles Morales returns to Marvel’s pages just in time for his big screen review. Coincidence? Hardly. This is Marvel, and synergy is what’s for sale. Now on to this week’s comics! Why It’s Cool: This is an emotional and well-told Batman story that may have you tearing up within the first three pages. Taylor and Schmidt are a pair of creators deserving of much bigger stages, and hopefully incredible work like this will help them get there. This is also a self-contained story, so even readers who have been off Batman proper for a while, can still pop into buy this comic. 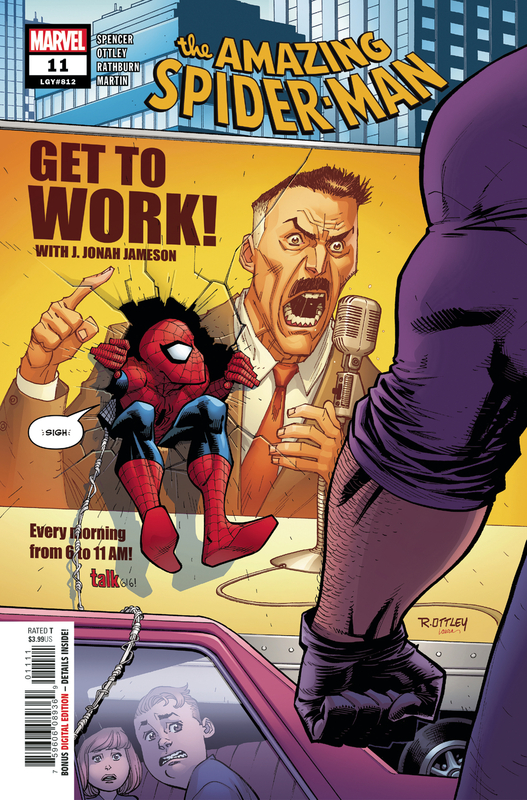 J. JONAH JAMESON has a new job as a shock jock, but is the world ready for a pro-Spider-Man JJJ? More importantly, is Spider-Man ready? His post-secret-identity relationship with Jonah was already complicated, but this very public embrace may put him over the edge! Spidey's definitely not ready for the Enforcers to come at him harder than ever! Why It’s Cool: If it weren’t for Immortal Hulk, Amazing Spider-Man might be our favorite book at Marvel right now (with apologies to Black Panther and Captain America). It’s just been so good since launching with a new #1 issue in July, and now it has artist Ryan Ottley rejoining writer Nick Spencer to presumably replicate the creative alchemy that made the first arc so special. It also has some momentum, with last month’s Amazing Spider-Man #10 ranking as one of our favorite issues of Marvel’s flagship Spidey title in many, many years. Why It’s Cool: The work of building this world and the way it works was set into motion so wonderfully by Bitter Root #1. Now, the creators are free to let us know more about their story and its characters. This is a visually lush and intellectually complex book, one that doesn’t flinch as it depicts monster hunters confronting ghoulish members of the KKK. In this second issue we learn more about the long-standing family dynamics at the heart of the relationships between our character. This book, simply put, continues to be an utter joy to read. Why It’s Cool: There’s so much Batman goodness packed into this first issue of the countdown to Detective Comics #1000, the comic that launched the character. It starts with a bizarre mystery and just gleefully builds from there. I didn’t quite know what to expect from this Tomasi/Mahnke run and hadn’t heard the kind of buzz one might expect for something like this, but this first issue is poised to build that excitement right back up. Why It’s Cool: This meta story of literary writers’ doubt barrels forward, with protagonist Henry Henry returning from the mythical storytelling Fearscape realm to the real world. This is a singular comic unlike anything else coming out today, and every issue is one to be poured over. This story brims in equal parts with braggadocio and imposter syndrome. For serious patrons of the art and would-be creators, this series continues to be a must. Check out our reviews of Fearscape #1 and Fearscape #2.